On November 27th I turned 31. It's the first year that I haven't planned some sort of birthday celebration. 25 was all about celebrating that quarter life of a century. 27 was my golden bday. 30 was...ya know: the big 3-0. When I think about the number 31, all I can think of is the house I grew up in Simsbury, Connecticut: 31 Harvest Hill Road. For 18 years that's all I ever knew as home. So I've deemed 31 my Harvest Hill birthday. And with that in mind, the concept of returning to my roots was resonating strong the day I turned 31. But not my Harvest Hill roots. My Hill 'n Dale Farm roots. Both my parents are from the Philadelphia area and moved back there almost a decade ago, and the majority of my family has always lived there. When I go "home" these days, it's to Philadelphia. I always make that journey at Thanksgiving time, which usually coincides with my birthday. Maybe it's because I've been seeped in local history at the museum I work at in Santa Cruz, or maybe just sheer curiosity, but the moment I woke up on November 27th, I knew I wanted to take a joyride to Hill 'n Dale Farm. 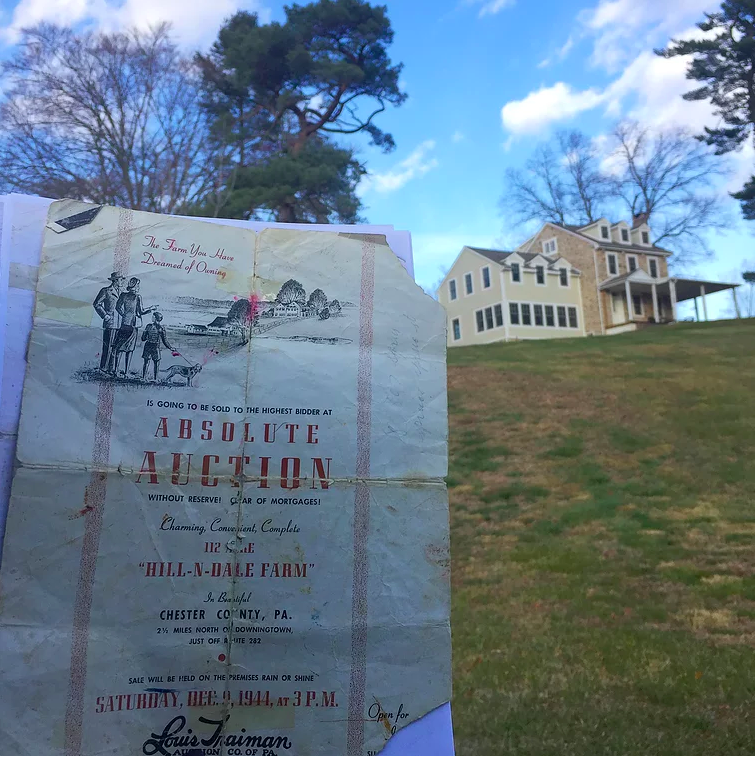 Hill 'n Dale Farm was purchased by my Great Grandfather, Israel DeCovny (who I am named after), in an auction on December 9, 1944. My Grandmother (Mommom Ray) was 13 at the time, and her family was living in the city of Philadelphia. This farm was in rural parts in Downingtown, PA: the road where it is located didn't even have a name yet, nor was it paved. 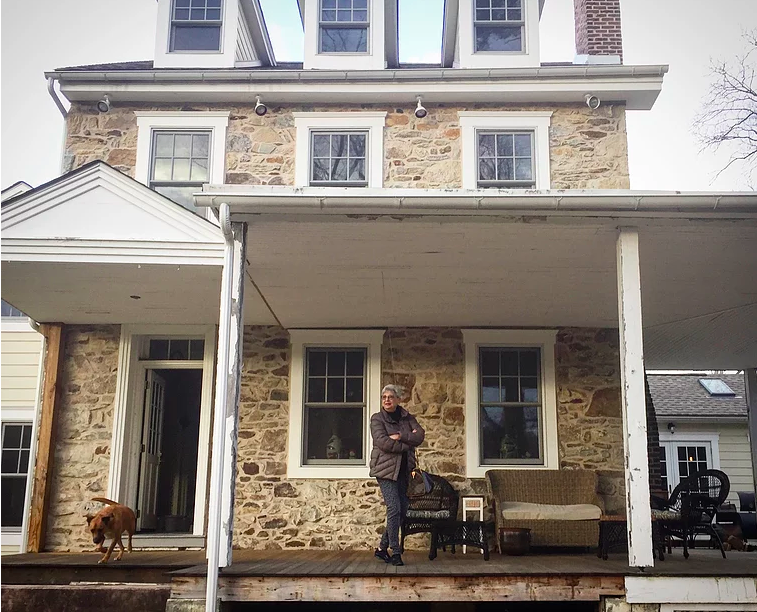 Originally built in 1796, the farm sat perched on a hill above a pond and consisted of a slaughter house, butcher shop, barn, and family home on a total of 112 acres. The property remained in our family until 2006ish, when it was sold to a developer who had plans to build several houses on the land. Fortunately for us, that never happened. It sat empty for a few years and I remember my Dad and brother taking a ride out only to sadly find the property unkept with broken windows. A family by the name of McGettigan bought the property in 2013, and we had heard they had been doing a fine job of restoring the house and land, which made everyone in my family very happy. Growing up, I'd always hear my Dad tell stories about "the farm" ---holiday meals ending with letters read aloud in Yiddish from our distant family in Soviet Russia, weekend sleepovers my Dad spent with cousins sleeping in the old, dusty attic where unending late night pillow fights resumed unknowingly to the adults down below, and a slew of injuries including Dad falling onto a broken Coca Cola bottle in the meat shop resulting with several stiches in the palm of his hand. I’ve always loved hearing about these particular snapshots in time. On my birthday, I phoned Mommom Ray and asked if she'd be up for a ride to the farm. Of course she was, but advised it truly would probably just be a ride: no guarantee we’d get into the actual house since we don’t have a relationship with the new owners. Will and I picked up my cousins and Mommom Ray that brisk & blue skied Sunday afternoon. Mommom Ray told stories all the way there: trying to find Dad in the towering corn fields, how she loved to help milk the cows & collect chicken eggs, and probably my favorite story is the one she shared about my Grandfather having trouble finding the farm on their first date… so Mommom Ray took the pick up truck out and met him at a local convenient store. The image of my Grandmother zipping by my Grandfather in 1948 in this pick up truck is just the best. As we approached the farm, we peered up at the house and the surrounding pond. I could sense the series of memories whirling within Mommom Ray’s mind. We continued to lurk, debating whether to even pull into the driveway. We saw a little face in the window, and a dog came running from the side of the house. "I wish we could go up there," Mommom Ray said from the backseat. One of the owners of the home came driving up next to us and rolled down her car window. Mommom Ray briefly explained how she used to live there many years ago. "Do you want to come in? Come on in! It's messy, but please come in," said Mrs. McGettigan. It was a warm & unexpected invitation. As we roamed through the house, Mommom Ray continued to tell stories of how this home held so many family occasions: my Great Grandmother would have friends from all over Philadelphia and even New York City come on Sunday afternoons, holiday meals where there would be a blazing fire in the original fireplace that still stands today; just dozens of people at the table and after dinner conversations that often led to “friendly” arguments. During this time, Mr. McGettigan came home and shared more about the restoration process. It became clear to me how important it was to this family to maintain the integrity of the original state of the home. When they obtained the house, it had been unoccupied for almost a decade and was close to unsalvageable. It probably would have been easier and cheaper to have just demolished it. The McGettigan’s also told us the remainder of the property has been divided into a few plots, just for their family members. It was comforting to know that this property is continuing to be a place for family: for cousins to run wild in the meadows, to find frogs in the pond, and now with a newly installed pool: summers just got a lot cooler at Hill ‘N Dale. The kitchen has since been remodeled, but probably the real cherry on top of this entire experience was the fact that there was a brisket in the oven….something my Great Grandmother often cooked, and Mommom Ray still cooks today.Nostalgia is a funny feeling. It warms you and hurts you all at once. I don’t know exactly what Mommom Ray was feeling as we explored Hill ‘n Dale that day, but I’m sure a strong sense of nostalgia was part of it. I felt it for my family, and I had never even lived there. Nostalgia is a funny feeling. It warms you and hurts you all at once. I don’t know exactly what Mommom Ray was feeling as we explored Hill ‘n Dale that day, but I’m sure a strong sense of nostalgia was part of it. I felt it for my family, and I had never even lived there. Today the number 31 comes up again in my life; not only the last day of the year, but my Dad’s 65th birthday. I think one of the strongest things my Dad has instilled in me, is something that gets at the heart of what BETTERISH is all about – the process of sharing stories. Simple stories; simple stories that build us in some way, shape or form. Whether making up bedtime stories (as he often did when I was a kid), giving a thoughtful speech (as he so memorably did for my brother’s and my B’nai Mitzvahs) or sharing his family stories on long car rides from Connecticut to Philadelphia…my Dad really knows how to set the scene with language. Before November 27th, I had only been to the farm once, but because my Dad has shared so many memories, so many stories…it seems as if I’ve been there several times. 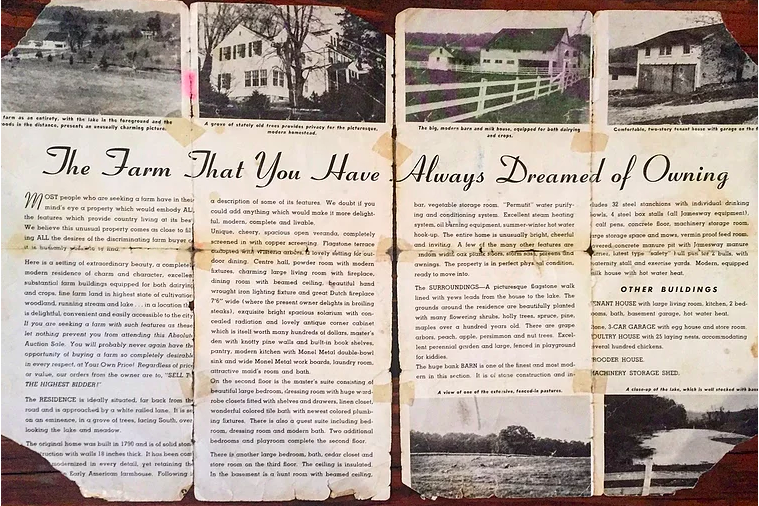 Though my family no longer has Hill ‘n Dale Farm, we have these recollections; these glimpses into our past, and what has shaped our foundation here in America. For my Dad, these stories come included with scars from the back screen door, climbing trees, and encounters with the resident wasps. For the McGettigan’s, who knows what stories will leave their mark, but this I know: there will always be plenty of memories to be made right beyond the meadows at Hill ‘n Dale Farm.